Home Encouraging What Happiness is Not! We might feel like we are failing at life if we don’t feel happy all the time. ‘What am I doing wrong’, we ask ourselves when that feeling of gaiety isn’t covering us up like a warm and cozy blanket. ‘There must be something else I need to do, I need to have or I need to give up or get’, thoughts swirl around our heads, which in turn only make us more confused about the situation – why don’t I feel happy? If feeling good all the time were our only requirement in this world we would answer ‘yes’, happily. The problem is we focus too much on trying to feel good, which actually undermines our ability to feel good at all. No amount of feeling good seems to satisfy us, because that sensation of contentment isn’t a 24/7 possibility. If you ask yourself what is important to you in your life, chances are you will say your family, your work, your car or house, how often do you hear yourself say ‘my happiness’? We have all heard of the cliche that recites like this, ‘money doesn’t buy happiness’! All too often we hear of people coming into good fortune and we think ‘how lucky are they’, but good fortunes always come with a price to pay. What IS happiness? Everyday our life changes in some form or another, our moods fluctuate, even our Ego can have a good or bad day, our weight on the scale goes up and down, our level of energy changes from day to day, the list can go on. I believe happiness is a state of mind, in other words I have the ability to control how I feel. 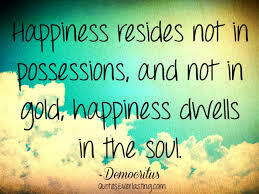 When I really began to understand this concept it was like a big weight was lifted off of my shoulders, I don’t have to seek outside of myself to be content and satisfied. Happiness is a choice at any given moment. Even the day’s when lousy challenges seem to roll out one after the other, I still have a choice to be happy or something else. I suppose that is why ‘living in the present’ is becoming such a popular sentiment, to allow yourself to stand in the breath of ‘now’, will allow the weight of the world to roll out of your nostrils as you breathe out and exhale. If you don’t feel happy right now, then you are trying too hard. Ease up on yourself, soften your cheeks and your eyebrows, and then smile, because really, ‘Life is Grand’.